Rumoured at the time as a summer hit, Perfect Lovesong was finally released as the third single from Regeneration in… Autumn 2001 ! The reason about such a delay are still unknown, the band was busy all summer playing festivals, and perhaps the single had to be released to promote the Autumn tour, which finally would be the last tour of the current line-up of the band. Being released in such a context, of an exploding band with rumours about a commercial failure (according to NME ), the single did not get the right publicity it deserved, and failed reaching only #42 in the charts. 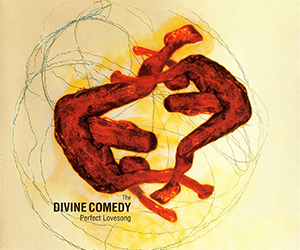 On the two CD are to be found a couple of outakes from the Regeneration sessions: ‘Thinking The Unthinkable’ and ‘No Excuses’, both of them were played during the Scottish tour in 2000, but forgotten at the time of the release of Regeneration. CD1 is completed with a cover version of Roxy Music’s ‘Oh Yeah’ which was played in summer 2001, but this time as a studio version. CD2 is filled with a no-DC track actually, Yann Tiersen’s ‘Les Jours Tristes’ which features Neil Hannon. 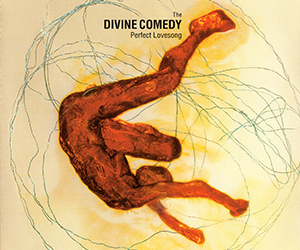 Taken from his album L’Absente which was released in France many months before; the song was included mainly as favour for the UK audience of the band, some of it founding the instrumentation closer to their memories of Divine Comedy rather than the band’s new sound and the single ‘Perfect Lovesong’. 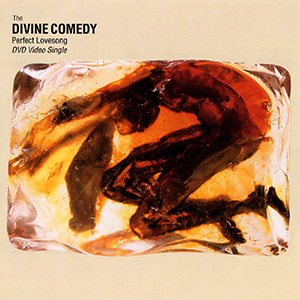 Finally, a novelty in the Divine Comedy catalogue, the third option for the single was not a cassette or a vinyl, but a DVD. The DVD was still quite new at the time, and to sound fashionable the management decided to release the single’s video as a DVD. For the rest they got it all wrong. While the DVD announces as bonuses a couple of live tracks, an interview taken from a TV show, these are only 30 seconds extracts, like if at the end of the day they couldn’t manage to obtain the rights for the complete document. Also, an iMonster remix of the song entitled ‘Perfect Love Birds’ was included. It features songs of birds playing the melody of the song over an electronic version of it, like a bad joke. And of course the idea of an audio remix was far to exploit completely the capacities of a video DVD.